"Vigilante forces have raided government military installations and "confiscated" tanks, planes, even warships! 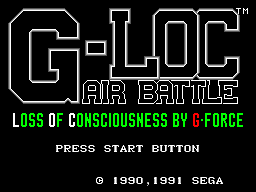 Pilot your G-LOC fighter to victory against the guerillas!" 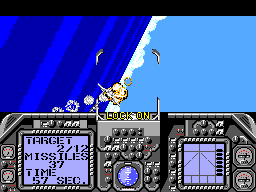 On the title screen, press 1, 2, 1, 2, 1, 2, 1, 2 on controller 2. This will activate the test mode and bring up a sound test. 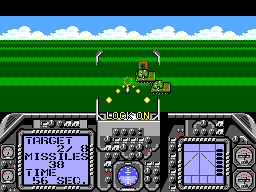 During gameplay, pressing '1' on controller 2 will complete the level and pressing '2' will change the terrain.